YOUR MAMAS NOTES: According to the Rupert Murdoch's British uber tabloid The Sun, American expat actor Johnny Depp and his French lady lover Vanessa Paradis have purchased a humongous 150 year old mansion in Somerset, England. According to Ms. Wonderland, the British lovely who tipped us off to the Sun article, the West Country behemoth sits in the Quantock Hills, a gorgeous rural area not known for mammoth mansions or big name celebrity residents. The article in The Sun reports that Meester Depp and Missus Paradis have embarked on a massive and expensive renovation to the tune of $5,000,000. When completed, the old hunting lodge will reportedly feature dee-luxe amenities like a tennis court, an indoor pool, and a helipad, natch. Interestingly, another article from The Sun, dated October 29, reports that Meester Depp was turned away at the trendy Fox and Goose pub in Fressingfield, Suffolk where he "is reportedly looking for a home in the area." Hmm. That's odd. One quick look at a map tell Yours Mama that Fressingfield is nowhere near the Quantuck Hills, so make of The Sun reports what you will. Meester Depp has no shortage of houses to call home around the world. The highly paid actor owns properties in the South of France and a 45 acre private island in the Bahamas. In Los Angeles the Depp digs include a huge spread just above Sunset Boulevard in West Hollywood previously owned by Bela Lugosi and celebrity divorce attorney Marvin Mitchelson, and recently the actor dropped $2,100,000 on a penthouse at the turquoise Eastern Columbia building in a rather unsavory part of downtown LA. Congrats to the soon-to-be-newlyweds! Arrrrrl. That looks like a totally new property. I doubt they would be allowed to knock down a 150yr old property so I would take the Sun article with a pinch of salt - they're known for reporting complete & utter rubbish, generally fiction. 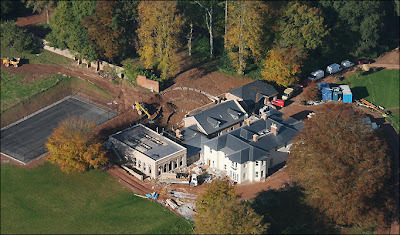 Also, £1.35M seems a little cheap for any country house in the U.K - even if it is dilapidated. It is 150 or so years old. The roof had to be totally replaced and the walls repaired and newly stuccoed. Work has been going on there for at leat a year, if not two, so the property was bought before the latest round of price inflation. The back part may be a new extension - the house is much bigger now than on Google maps satellite pic. from thin air, because the builders are keeping quiet. Just a nice aside: Word is that the couple are unfailingly polite when out and about locally, and never pull the "I'm a celebrity trump card" - no wonder they don't want to live in LaLa land full time. Settling in to start filming the Freddie Mercury movie, perhaps? Great site. I have a blog I've started on Real Estate, Technology and Marketing. I'm focusing on Web 2.0 applications, but there will be a lot about relevant technologies. Spotted last week in Stowmarket, Suffolk. Apparently his wife was seen buying antiques in Eye. Living in Debenham,suffolk the latest rumour around here is that Johnny is buying Jasper Conrans old house,Flemmings Hall in Bedingfield,suffolk...a lovely secluded very rural village within spitting distance of Eye. Just a beautiful part: Word is that the couple is destined to be polite when out and about locally, and not pull the "I'm a celebrity trump card" - it's no wonder they do not want to live in LaLa land full-time.